The Swiss ski resort Wengen is one of the prettiest resorts in the Alps, surrounded by the mountains Eiger, Mönch, Jungfrau and Lauberhorn. Unspoilt nature of the village with its traditional chalet-style buildings, makes Wengen one of the oldest and most popular holiday destinations in Switzerland. Wengen is a car-free village making it a safe location for children. Wengen ski resort is a home to the Lauberhorn World Cup race. Wengen and neighbouring Grindelwald share the Jungfrau ski area, which covers 213km of pistes ideally suited to intermediate skiers and beginners. Wengen is a place which has a lot to reveal! Located in Central Switzerland, alpine village of Wengen is part of the Jungfrau ski area. Wengen is called a paradise for beginners and intermediates skiers. This ski resort was one of the first in the Alps to introduce ‘Slow Slopes’ which are limited to 30km/h. Wengen also offers toboggan runs and almost 100 kilometres of winter hiking trails. You might also like to take the mountain railway up to the Jungfraujoch area, the mountain which is often called the “roof of Europe”. Accommodation in Wengen is amongst the most convenient of all Swiss resorts. All resort facilities and ski slopes are close by and easily accessible. There are some great restaurants in Wengen, many of which are based inside hotels but are open to the public. There are also busy bars and cinema in Wengen. After the day on the slopes, you can try other activities, such as indoor tennis, indoor swimming pool, squash courts, heli-skiing, curling, winter walking, hang-gliding, billiards, sauna and bowling. There is a train station in Wengen, which is only a couple of minutes walk from the city centre. Although Switzerland is famous for its efficient rail network, we recommend you to order direct airport transfer to get to your chosen destination. That is the most convenient and time-saving option. We always carefully calculate all resort transfer services individually, to ensure that our customers always get the best offer. Whenever you choose to travel and whatever your final destination, Alps 2 Alps will get you there for the lowest possible price. However, we advise booking early to access the best possible deal. In addition, keep up to date with Alps 2 Alps for the latest offers, deals and discounts on Wengen resort transfer services. All of the above will only ever result in our base-rate for ski transfers going down – we never over-inflate our prices at any time or for any reason. We also offer substantial discounts for off-peak, off-season and midweek transfers to Wengen. If looking for the best possible deals, travelling outside peak season or midweek typically results in the biggest savings. We offer midweek (Monday to Friday) prices with up to 60% discount than weekend prices. Your transfer quote will also depend on vehicle availability, transfer schedule, vehicle utilisation and other costs like road tolls and airport parking charges. In all instances, we work hard to keep our prices low and are relentlessly committed to total value for money. Which is why we guarantee you won’t find a better deal on your Wengen resort transfers, whatever your needs. The resort of Selva lies at an elevation of 796m, with a max vertical of 1,070m and its highest lift going as far as 2,320m. Wengen is a large resort with 33 pistes and 19 lifts (including 10 chair lifts, 4 surface lifts, 3 trains, 1 gondola and 1 cable car). Around 38% of the slopes are ideal for beginners, 40% serve the needs of intermediates and the remaining 22% are far more challenging. The appropriate ski Lift Pass will allow you to ski or snowboard in the other Jungfrau Region ski resorts of Grindelwald, Lauterbrunnen and Murren. Jungfrau ski area can offer you the access to 378km of downhill skiing, with 131 individual pistes, served by 66 ski lifts. Wengen is a pretty little town and is car-free. Families with kids will enjoy wandering the pedestrian streets. Also, there is the Figeller children’s area, where the Swiss Ski School run lessons, with 4 magic carpets and 3 drag lifts. Kids will love the resort’s toboggan runs. 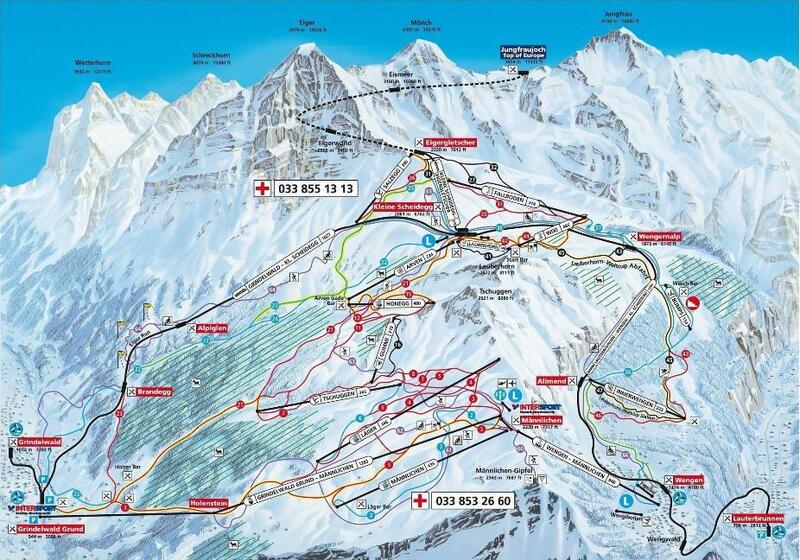 Wengen ski resort is a truly spectacular location for a family ski holiday! This charming resort has a lot to offer – besides excellent skiing, there is another side of this wonderful village. You can walk on the main street and have a look around the shops or take a day out of slopes to visit the town of Interlaken. You will be able to see the beautiful lakes in Wengen. Take all the advantages of your holiday! From our point of view, Wengen ski resort transfers are about so much more than getting you to your final destination. After all, you also want to arrive comfortable, refreshed and ideally on time. Not all resort transfer services can promise this – Alps2Alps guarantees a higher-level service for every passenger. Always be aware of all kinds of deals, discounts and special offers that could make your trip even more affordable. If looking to secure your seats for the best possible price, booking as early as possible is advisable.